Escape the city lights for a night or two for a camp out under the stars. Travel by wagon or horseback through a Joshua Tree-lined trail taking in the breathtaking desert landscape and panoramic views of Spirit Mountain. Chow down on a home cooked western fair, camp out under the stars and enjoy live entertainment from the ranch's own cowboys. Located near the Grand Canyon West Rim is the Grand Canyon Ranch, a working ranch where you'll get to experience the ultimate cowboy experience. Throughout your stay, enjoy cowboy entertainment, see the sights and consider the other available activities including horseback rides, gun range shooting and more. 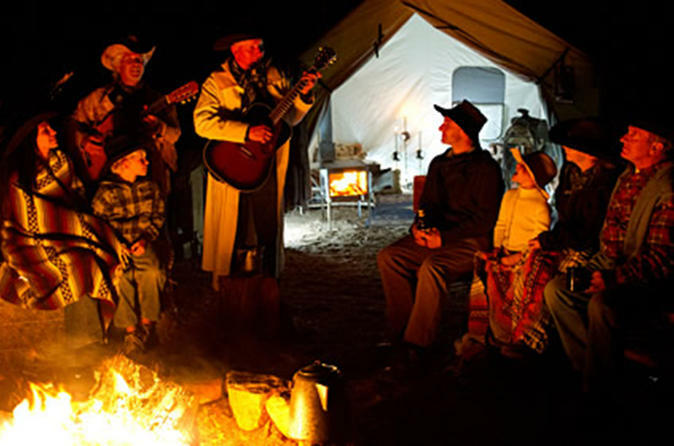 As twilight falls, cozy up to the campfire and enjoy the live music and stories of the Old West from your cowboy host while you make S’mores below the beautiful night sky. All cabins are equipped with a double bed and pull out if requested. The front living area includes a quaint gas fireplace and air-coolers. All cabins have full, indoor bathrooms which are equipped with a historical claw foot bathtub and shower. Self-drive Overnight Camp Out (B, D): After your scenic drive through the Arizona desert, your journey starts as you ride horseback through a Joshua Tree-lined trail, through the breathtaking desert landscape. Enjoy the spectacular panoramic views of Spirit Mountain as you climb into the vastness of the open range. As you near your Cowboy camp at sunset, you will see a real heard of buffalo. In the evening you'll enjoy a home cooked western steak dinner while you relax in the company of your fellow cowboys and girls. Then relax under a canopy of stars and relive the history and stories of the outlaws from the wild west. Just after sunrise, wake yourself up with a freshly made cup of cowboy coffee and then it's time to saddle up and head back to the Ranch House for a hearty breakfast. Ultimate Overnight with Cabin Accommodations (B, L, D): Your day will start with transport from Las Vegas to the Grand Canyon Ranch. After checking in you'll be transported to the helipad by wagon which you'll ride through the rugged desert landscape. Then you'll board your helicopter for a 20-minute scenic flight into the Grand Canyon, one of the natural wonders of the world. You will enjoy full meals during your stay, live entertainment and a relaxing evening under the stars.